I've discovered Preserves this summer. Sure, I've been "preserving" for a few years now: freezing, drying, canning, etc. And I've certainly preserved fruit before. But a Preserve. It's not whole or sliced fruit floating in simple syrup. It's not jam or jelly. It's somewhere between the two: chunks of fruit in a syrup, often with additional flavors. I know it sounds strange, but I'm finding preserves to be a little bit more flexible, more "ready to eat" than just fruit in jars. See, I canned apricots back in 2010. Almost 20 pints of golden orange yumminess. We're still eating them. A pint is just slightly too much, so a jar gets opened and then it gets ignored until, in desperation for fridge space, I make a smoothie. (No, I'm not going to pack apricot halves into half-pint jars... that's just crazy.) Canned apricots go well on yogurt, but not on pancakes or ice cream. And they've already been cooked (via the canning process) so they don't really work in tarts or pies. I suppose I could make an apricot cobbler out of them by cooking them down some more. But with preserves, it's all ready to go. Warm the preserve gently, add topping and pop it in the oven. It can also be a pancake topping. A yogurt stir-in. A toast spread. And a cake upgrader. All in one jar! With this approach, I might actually stockpile less food each year. Besides, they are just pretty! 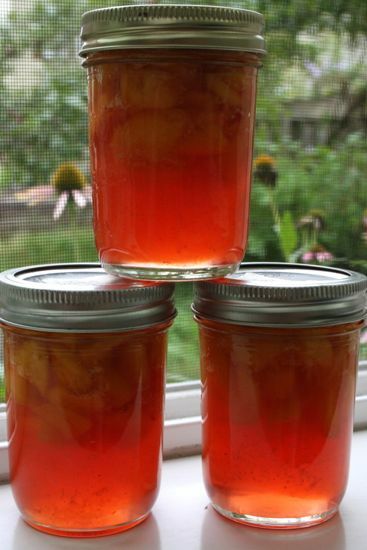 These are peach preserves. I've got apple and tomato as well in the pantry (no, I'm not likely to put tomato preserve on ice cream, but it's amazing in a sandwich), and plans for several berry varieties. I'll probably stop there... I expect I'll be out of jars!